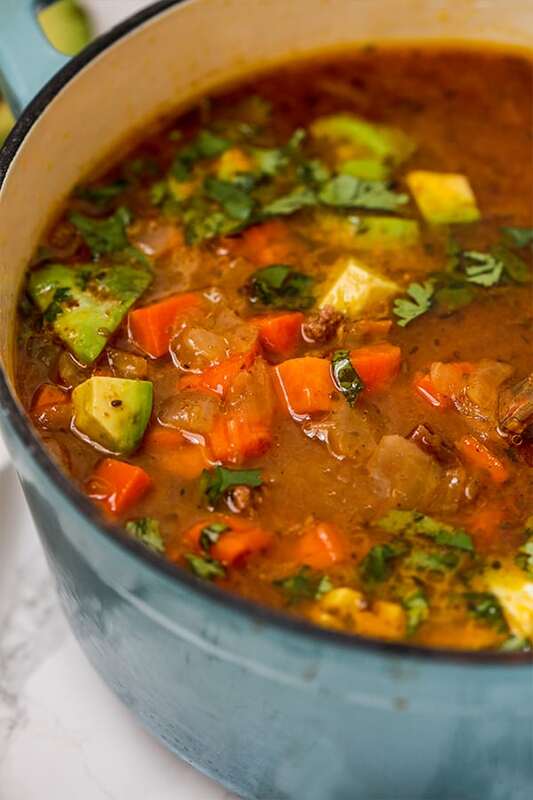 This paleo pumpkin chili is the perfect warm and cozy dish for fall! It’s whole30 compliant and is easy to make AIP and nightshade free. When I first discovered my nightshade intolerance, I wondered how in the world I would ever have chili again. Chili is such a hearty and flavorful comfort food and one that I didn’t want to accept never eating again. But, how do you have chili without tomatoes, red spices, cheese, and beans? Aren’t those the main ingredients? 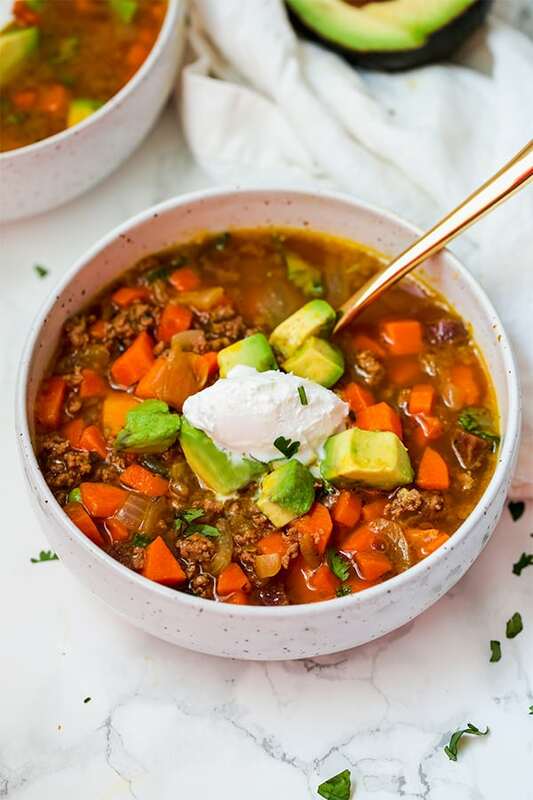 This paleo pumpkin chili is AIP, whole30, and has all of the cozy fall flavors you love without the nightshades, dairy, or legumes! 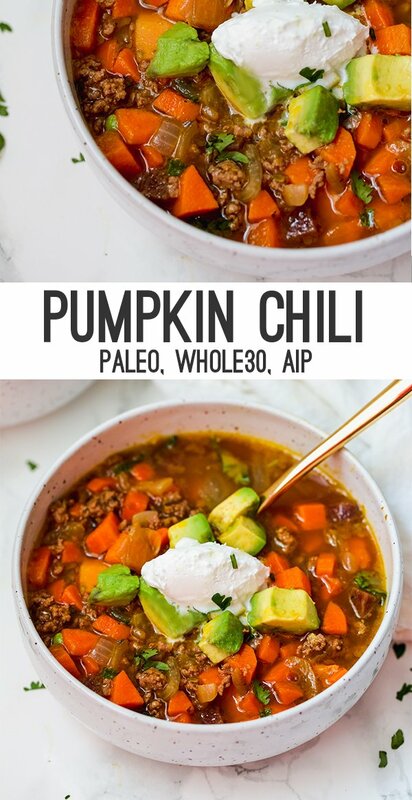 I didn’t believe it until I tried it myself, but pumpkin is amazing in chili. We’ve turned pumpkin recipes into an ultra sweet and sugary treats, but really pumpkin is still a vegetable and tastes great in savory recipes. What’s great about pumpkin chili is that it’s not expected to be super spicy and full of tomatoes, which makes it a natural choice for nightshade free, AIP chili. But even if you have non-AIP or paleo family in your house, I promise that they’ll still love this chili! My husband is a spice and cheese enthusiast and he still loved how cozy, seasonal and hearty this chili was. And of course, you can always layer on ingredients for those who tolerate them. I’m a big fan of cooking with ground beef because it’s so cost-effective and easy to use. However, you can also use ground turkey if you prefer. You can use a can of diced tomatoes if you tolerate them, but I used my nightshade free “tomato” sauce to make it nightshade free and AIP. I used canned pumpkin puree, but you can also use fresh pumpkin. These help to flavor the chili and add some more substance. The carrots and sweet potato add more nutrients and flavor to the chili, and make it so you don’t even miss the beans! In my opinion, no chili is complete without avocado. I also used coconut cream and apple cider vinegar to make a sour cream, but you can honestly do without if you prefer to keep it simple. This pumpkin chili is rich and hearty! It’s nightshade optional, whole30, paleo, and easy to make AIP. Using a large stock pot or dutch oven, saute the ground beef on medium heat until browned. Remove from the pot and set aside. Reserve about half of the fat in the pot for cooking. Saute the onions and cook on medium heat for about 5 minutes. Add in the garlic and saute for another few minutes. Add in the carrots and sweet potato and cook and stir for 5-8 minutes or until slightly softened. Pour the broth, tomato/nomato sauce, pumpkin puree, and ground beef and stir well. Add the seasonings (reserving half of the cilantro for garnish) and stir well. Bring the chili to a simmer and cook for 30 minutes, stirring occasionally. Taste to ensure the veggies are cooked to liking and season further to taste. 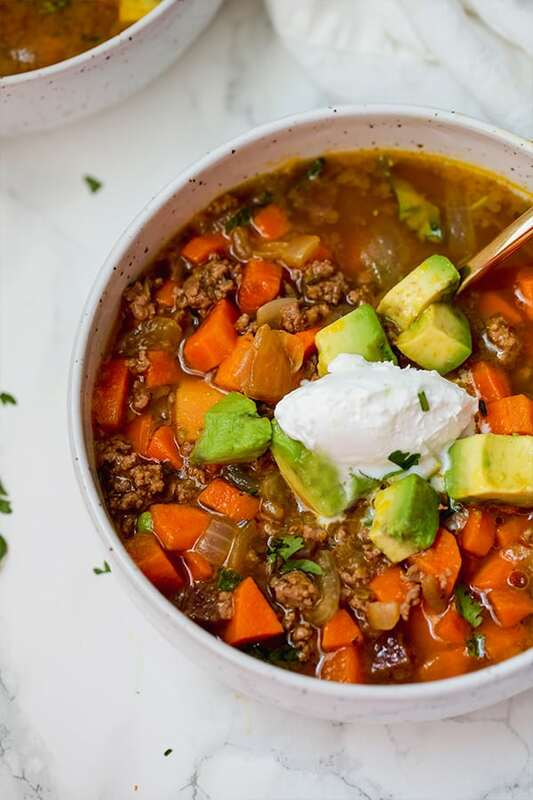 Serve the chili topped with avocado, dairy-free sour cream, and cilantro. This is delicious…just made it and eating it as I type. I’m so happy to add this to my list of comfort foods. THANK YOU!! Can this be made vegan too. No meat or beef broth. ? Love this recipe! I made a couple of changes. I used ground organic turkey and low sodium chicken broth instead of beef. I used the whole can of diced tomatoes and pumpkin rather than try to save it or throw it out. Used plain yogurt instead of sour cream. Freezes well and makes great leftovers when you do not have time to cook! Would this work in the slow cooker you think? I think it would! As long as you brown the beef before, it should work just fine. Made this & even my kids loved it!! Yay! Thank you so much Katie!!! So happy to hear it! I used to make a traditional chili every week before starting AIP, and have been missing a hearty bowl of delicious. I was skeptical, but tried this recipe out–as well as the nomato sauce–and I am thoroughly impressed. Thank you. I will definitely make this again. Thank you SO much, Michael! I’m so happy you like it! Delicious. My husband loved it. I did cook it in different order because the ground beef I used isn’t very fatty. I also added 2 tablespoons chili powder and 1 tablespoon cumin. I like a lot of flavor! I’ll be making this on repeat a lot this winter. Yay! Sounds amazing! Thank you so much! Love this recipe! I have made this, at LEAST 10 times in the last 3 months. And correct, this is very easily adaptable for an AIP diet. I like to add a can of coconut milk, and shredded coconut to my chili. Made this for dinner tonight. It was a big hit! Will definitely be making it again. The best paleo chili ever! Thank you Michelle! I’m making this recipe for the first time. It looks so good – I love the idea of adding pumpkin! Michelle, I’m wondering why you say to omit peppercorns if AIP. I have been on an AIP diet for quite a while, and I was never told to forgo peppercorns. All peppers – bell, jalapeño, etc – but not peppercorns. What do you know that I don’t? Hi, Maggie! Black pepper is not a nightshade, but it’s a seed spice and all seeds are omitted on the AIP diet for the elimination phase 🙂 Enjoy the chili! Oh, thanks, Michelle. So good to know!